I'm recapping all the fun I had sewing last weekend at the Austin Modern Quilt Guild's sewing retreat. My goal was to knock out some Summer Sampler Series blocks in Terrain fabric. After finishing a Mosaic block on Friday and Star and Arkansas Traveler blocks during the day on Saturday, I decided to burn the midnight oil and work on a Lucky Pieces block. There are a lot of pieces to square up in the Lucky Pieces block, so it was late when I finally went to bed. I crawled out of bed ready to sew on Sunday, though. I had been pondering the teal colors of the Terrain prints as I went to sleep, so I started picking out colors first thing. This Minnesota block wasn't my favorite of the Summer Sampler Series, because I felt like the hourglass shapes were distracting. Since I was limited by my available fabric, I decided to go scrappy. Now I love this block! Of course I had to fussy cut some of the Stonecrop print in the Foliage color for this block. I think it would look even cooler if you could separate the values to make a slightly lighter diamond with those inner triangles. That's a sewing experiment for another time, though. I'm thrilled with the amount of sewing I got done in 48 hours. I went from five blocks to ten blocks over the course of a weekend. Hooray! P.S. I love my new DIY clothesline! I hope you have a productive weekend of sewing ahead of you! These are so pretty! You've done a lovely job with the prints and the blocks. 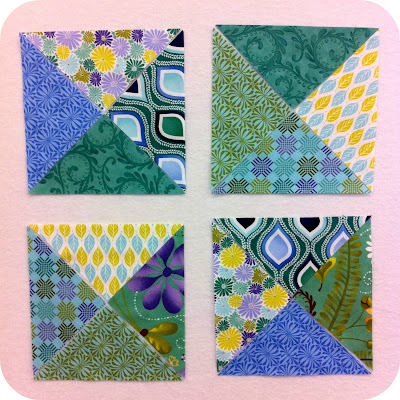 Great choice to use Terrain for this quilt! love the fussy cutting! As usual I am in awe of your skills! All the blocks look fab, and so much intricacy in there! The color choices pop so well! Great job! Wow, those blocks look totally stunning! I love the Minnesota block, too. It was so much fun to watch these blocks come together! This is going to be one bright, happy quilt when you're all done!! !